Careful With That Axe, Eugene: 8th July – White Water Rafting! 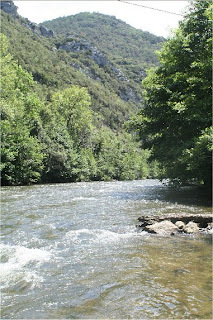 Today we went to St Martin de Lys for white water rafting with Embarquement Immédiat on the river Aude in the Pyrenees. It was a 1.5 hour drive to get there along mostly narrow roads, but it was worth the wait. We got there at about 11.45 and were soon kitted out in wetsuits. We were brought by minibus to a starting point further up-river – this was a bit of a roller-coaster drive as our driver, who was also to be our guide on the river, treated us to fast driving on very narrow mountainous roads. Following safety instructions, all six of us, plus two other French people and our guide set off on our inflatable raft. We had a book on who would fall into the river first – Vicki was the hot favourite! The beginning of the river was easy enough – some short rapids in very beautiful scenery. The gorges here make the Glen of the Downs in Wicklow look like a scratch on the surface of the earth. Spectacular sheer rock faces towered above us – fantastic! We passed through the village of Axat and headed on down towards the more difficult parts of the river. Before this we hit a rock and a French girl and I fell into the water – cold! Amid much mirth from the girls I was hauled back into the raft by Roma. How embarrassing to be the first to fall in. The end of the river was the best – some serious (for us anyway) rapids, four in quick succession. Great fun, the girls loved it, and all decided that we would definitely do it again if given the chance. White water rafting is great fun. The whole trip on the river was about an hour – our guide told us that a French canoe champion has covered the same distance in 16 minutes. It was expensive (€39 each), but worth it. We went back up to Axat afterwards for some lunch at a café which overlooked the river – we watched as others passed by in a variety of rafts similar to the one we had used. On our way back to Sigean we stopped off at the European Prehistoric Museum in Tautavel. This is the location of excavations of materials from 450,000 years ago and is also the site where a famous partial skull was found – Tautavel Man. The museum is interesting and there were a lot of excavated artefacts to see mostly bones and stones. It’s the type of museum best suited for school trips as it is very informative about prehistoric times. There are lots of posters and videos to stretch out the stones and bones. 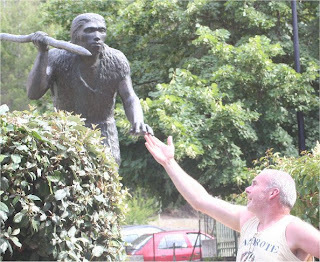 On the right is a picture of me with one of the 450,000 locals in Tautavel. This was a long day with a lot of driving in the mountains. I had a text message from Joe about the rain in Ireland which has been non-stop since we left. While nice and warm, it was a bit cloudy here – we have had several cloudy days up to now mixed in with some sunny days. I had a call from HOG Assistance to update me on progress – the caller told me that Macadam Moto had not yet even looked at the bike! It was up to me to update her on progress as I had been speaking to Macadam Moto last Saturday. I’m now very worried about getting home. As I write this post it is 6.30 in the morning. I woke up at about 4.00 and could not get back to sleep – my mind was racing ahead as to what to do if the bike is not fixed by Saturday when we leave Sigean. The bike has now been in Macadam Moto for eight days and I still don’t know when I’ll get it back – I’ll call them myself today to try and find out. They are aware of my predicament and I’m sure they are doing their best – but right now I feel like going up there and pointing a gun at the mechanic’s head to fix my bike on the spot. Bringing the bike on this holiday has been a disaster – apart from a quick spin last Monday I have not been able to ride it at all since I got here. It has also been expensive, ferries and hotels cost a lot more than a direct flight – and I’m not done yet. Finally, I had a text message from Stena Line telling me my ferry from Fishguard in Wales to Rosslare next Monday is cancelled. Can anything else go wrong on this holiday? I’m in no hurry to fix this until I find out what’s happening to the bike.